A Power Animal is a manifestation of Spirit, life force and power, sent to aid, guide and protect an individual. For example, a Dolphin chooses you. This Dolphin energy is a representation of a collective whole known as "Dolphin" but the way it interacts with you is personal and individual. You may also resonate with or experience, a shared familiarity with others who also work with Dolphin. I had no idea what a Power Animal really was until I attended a workshop in 1990 to learn how to journey and retrieve one. I had experiences with my Band Members claiming me in other ways the year before but attending the workshop put things into a clearer perspective for me. Besides, the community support helped me to feel more comfortable with the ideas coming to me at the time. Your intention is to experience your Power Animal - four times in four different ways during a shamanic drum journey, to ensure that it is the one for you. These four experiences represent the gifts, strengths, abilities and challenges that a Power Animal brings to you. It is who you are and describes how you operate in the world. By understanding the Animal or Bird etc, you better understand yourself. - they are playful, community minded beings. 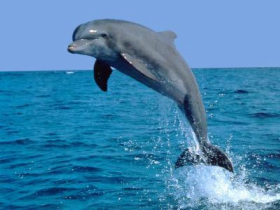 - Dolphins swim and live in the ocean. Since water is their element, it could mean that you are comfortable in or around the water. You might easily deal with emotional states or be challenged to learn the lessons held by these energies. We all have a certain amount of personal energy and a Power Animal or Ally is an added bonus, sort of a personal battery boost. On the other hand, Reiki is different from personal life force. Reiki is in everything and is available to everyone. Giving Reiki enhances our well being but giving away your power to someone or something will most certainly deplete you. You can lend power by petitioning a request by asking your Power Animal to help someone else in need on your behalf. A Power Animal also acts like or offers a warning signal, a built in protection that helps you take your power back in certain situations. Power Animals may come to humans in many different ways, through dreams, meditations or journeys to the lower world. One may command your attention when you are out in Nature. Your job is to pay attention to their messages. They are happy to be of assistance and to be given recognition for their efforts. Sometimes a Power Animal acts as a messenger for a particular Spirit Guide. One of my Grandmothers always gets my attention when "just one little bird" is visible and is doing something to make me notice it's presence. The little birds are her messengers. Once, while sitting at an outdoor cafe a friend exclaimed, "Oh look, it's doing that, that Michael Jackson dance!" The bird was hopping backwards on our table. My friends and I all laughed because we knew that this Grandmother has a sense of humor! Some Power Animals ask to remain a secret not to be shared with anyone else. Some bring serious gifts, not to be taken lightly. They will let you know what type of exchange they want from you or wish to share with you. My Grandmother says that I teach her how to play in exchange for something else that she gives me. The ThunderWolf Pack assist me as I strengthen my Community and Leadership skills. They co-facilitate our WolfWalking Drumming Circles. 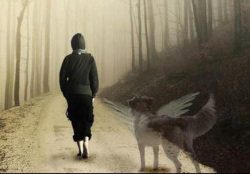 Can my deceased Pet be a Power Animal? I consider it an honor to work with a Power Animal in the physical. I was able to work at a Sanctuary for Wolfdogs http://fullmoonfarm.org/ and facilitate drum journeys while I was there. The Wolfdogs had their own messages to impart which were well received and acted upon. This is a great example of one of the ways in which we can work together with our Power Animals for mutual benefit. Are you curious to discover the gifts your Power Animals bring to you? in a Power Animal Retrieval session? Sonara will drum on your behalf in this session. She'll journey for you in non-ordinary reality. She will help you gain clarity and understanding by discussing her journey with you upon her return. 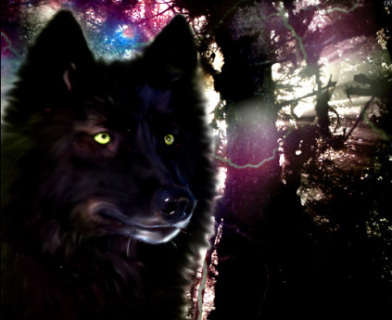 Sonara will find and retrieve a power animal for you so you are guaranteed to receive at least one.